The stewardess’ spill had made the financial documentation wet and soppy. Wilson hated this responsibility. Trying to kill the thought, he clicked his pen twice, bit the end, and then shot it like a missile at a crossword puzzle that sat on his tray table below. He knew this. His hands scribbled Xenophobic in bold letters. It had been a tough one. The ink was wet. He blew a gust at the page. Wilson loved puzzles. They distracted him. Otherwise, he became anxious. I am not xenophobic, thought Wilson, trying to maintain distraction. He looked out the window from the cabin of Flight 756 from San Juan. By midnight, he would set down in Louisville, Kentucky. Bogotá – There was a celebration when we landed. It’s traditional in Colombia to clap when the plane hits the runway. My hands, however, were cradling my head. It is Tuesday May 29th and I’m dizzy. As we swooped in at 2,600m above sea level, I grew intoxicated with altitude sickness. Whispers of Spanish flickered around me as the flight came to a halt. I sat next to a tall Colombian-American boy who was on vacation with his family. I learned that he was studying medicine in Florida, and I also learned that he was the only boy in a family full of women. All of his siblings, whose chatter filled the rear of the cabin, seemed happy. But not his mother, whose face looked as weathered as the Bogotá I’ve come to know – the one that turns blue skies into rain and storm clouds into sun in what seems like a snap of the fingers. Things can change fast in Bogotá. Immigration didn’t stop me. I always feel as though officials have the power to come up with a silly reason to stop you at immigration. You didn’t spell your address correctly. You can’t speak Spanish. You’re too old. You’re too young. You’re too beautiful. I’ve been here before. In 2009 I came to Colombia to study Spanish for 2 months. I remember the fear and anxiety that plagued me when I landed in Medellín at the beginning of the summer. But suddenly there was an old friend from university and a handful of others hanging over a balcony in the Medellín airport. They were shouting and waving, and my welcome, indeed my entire time in that lovely city, was warm. Right as I walked away from the currency exchange window, I heard my name being called loudly. Cristian and Nataly, two members of the AIESEC Trainee Integration team, met me with huge hugs. They took photographs. They gave me a small traditional Colombian pouch with a hand-made Colombian poncho inside. A small bottle of aguardiente, the national white rum touted as a point of Colombian pride, came tumbled of the pouch as well. Then they bought me a hamburger. I was happy. I felt comfortable. I felt safe. The first thing you learn when you get to Bogotá is how dangerous it is, and how you have to tener cuidado or be careful. At first, I didn’t understand exactly what this meant. Did it mean that I was going to get killed? Kidnapped? Robbed? Tripped? Does it mean that some parts of the city are more dangerous than others? It sounds like I have no choice when it comes to danger. As we zoom toward the house where I will stay for one week until I get settled, something in Colombia is happening. When I learn of Langlois, my first impression is of a terrified hostage who is relieved to be set free. But Langlois is not your average hostage. During his 30 days in captivity, Langlois rigorously interviewed and documented the life of the guerrilla soldiers whose political motives and weaponry could decide life or death for the young Frenchman on a whim. He emerged from captivity claiming that he was treated well, and that the FARC desperately want to talk peace. Langlois came out of captivity singing the story of one of Colombia’s most marginalized and feared guerrilla groups – and how the international community needs to put pressure on Colombia for a peace process. The next morning, as I read up on the news about Langlois’ mission, captivity and release, I also set out on my own mission: to learn the notorious Transmilenio, Bogotá’s public transit system, and try not to get lost. Langlois’ story reminds me that I – like everyone – have a mission too, but more importantly, I have a choice. I can weigh the risks in favor of safety and security. That is the route most people around me take in Bogotá. Colombia is not all war and conflict, but it does exist. I can, if I choose to, weigh the risks like Langlois did. I can make it my mission to get to the heart of a dangerous, messy, and deeply complex political story, and try not die. Being Roméo Langlois – a reporter – is something that’s been on my mind for awhile. Colombia, a country where reportage is important but risky, is no doubt an exciting place for a youngster to dig in and cut his teeth. Then again, I think I’ll be patient. The ship Ana Cecilía is tugged through Miami’s port, where it will depart to Havana. On July 13th, direct merchant shipments from Miami to Havana Harbor started up again after 50 years of a US-enforced embargo on trade between the U.S. and Cuba, according to a report in Businessweek. The Ana Cecilia, a sleepy, blue-hulled ship that carries a maximum of 16 containers, is operated by the International Port Corporation. Making a 16 hour trip, the Ana Cecilia shipped cargo sent from religious and humanitarian groups, and delivered packages from family and friends in Miami to Cuba’s port, where Cubans observed. Most are not phased. “I have been fishing off the Malecon for the past 12 years… I don’t think the appearance of a new flag on the waters of Havana Harbor is going to change my lifestyle,” Businessweek quoted Daniel Herbert, a fisherman, as saying. The Miami side shares little anxiety as well. According to a report in Portafolio, a Colombian business news journal, there is a law that says a ship cannot leave from Havana and return to Miami until after 180 days. 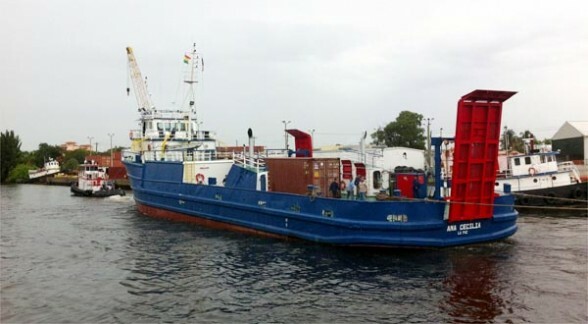 However, IPC’s Leonardo Sánchez Adega says that there is little reason to worry about any complications, explaining that IPC possesses all of the permits that are needed to enter and exit Cuban and American waters. On July 7th, The Economist reported that Vietnam and China reignited a wave of nasty signals toward each other over oil rights in the waters surrounding a string of archipelagos in the South China Sea. Until June 21st, the Spratly and Paracel islands enjoyed a momentary calm after China and the Phillipines shouldered off an impending skirmish. But the calm did not last long. Vietnam re-asserted its claims to the islands through a parliamentary decree, to which China responded vehemently, claiming that Vietnam had violated its sovereignty. In turn, the Chinese government immediately upgraded the status of the municipality that governs the Spratly and Paracel islands, giving it more jurisdictional leverage. Worrying mounted again when CNOOC, a state-directed oil firm, declared that it was opening bids for drilling in a zone not too far offshore from the islands to which Vietnam lays claim. The two countries have a wary eye on each other, but despite the boundary scuffle, neither country seems too keen to break diplomacy and act aggressively. Hilary Clinton is scheduled to visit Phnom Penh in mid-July to discuss security in the region with Yang Jiechi, China’s foreign minister. 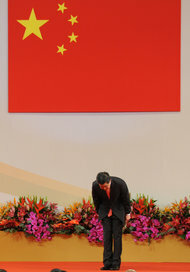 China does not want to tarnish its image with an act of mischief. But under the surface, back at home, China’s newspaper Global Times is less restrained, saying Vietnam should be punished for its advance on China’s sovereignty.